The Food and Drug Administration announced Tuesday it’s cracking down on e-cigarette retailers and manufacturers as the number of children vaping continues to increase. Jodi Hernandez reports. The Food and Drug Administration announced Tuesday it’s cracking down on e-cigarette retailers and manufacturers as the number of children vaping continues to increase. In the Bay Area, Walnut Creek's Northgate High School administration has pulled many e-cigarette devices from students in the last few weeks. "We're pulling it in constantly," said Principal Michael McAlister. He says vaping has become a widespread problem among students at his school and across the Bay Area as companies make their nicotine filled e-liquids in kid-friendly flavors. "Bubblegum, mint chip, chocolate. It's almost like you’re looking at an assortment of ice cream flavors," McAlister said. Teachers fear these products are more dangerous than regular cigarettes and that teens don’t understand the risk. 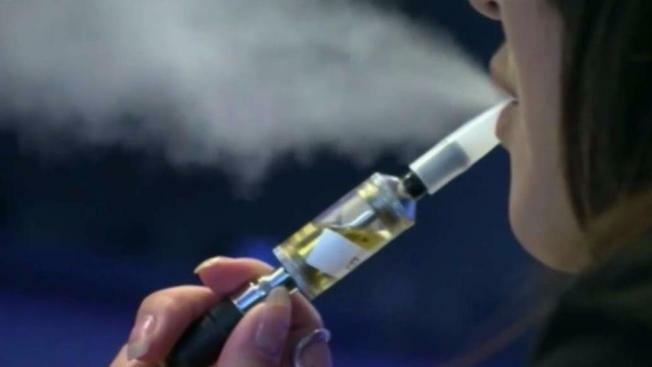 "What they really don’t realize when they're vaping they get a lot of extra chemicals as well as metals going into their lungs and that’s not something you’d get with cigarettes," said teacher Tessa Eckenfelder. The staff at Northgate is doing its best to tackle the problem by having parent education meetings and peer to peer counseling but so far, they have seen no sign of a slowdown. "The idea is to help the kids stop help them recognize the active ingredients of the stuff they're putting in their bodies is creating great damage," said McAlister. "The amount of chemicals being aerosolized into kids' bodies is quite frightening." Forty out of the 54 Northgate High suspensions this year have been cases of vaping. "We are creating another generation of addicts," said McAlister.